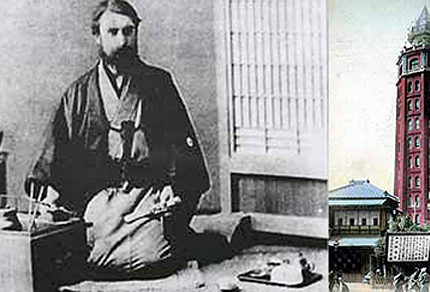 During the late Edo (1603-1868) and early Meiji (1868-1912) periods the Japanese government recruited hundreds of Westerners as advisors, teachers, and engineers in an effort to transform the country into a modern state. Known as ‘Oyatoi-Gaikokujin’ (hired foreigners), these men would play a vital role in the modernisation of Japan. This public seminar explores the impact of oyatoi-gaikokujin from the UK who went to Japan during the Meiji era. Joining us will be Keizo Kutsuna (Curator at the Meiji University Museum) who will discuss William Gowland’s role at the Japan Mint, and Professor Ian Nish (Professor Emeritus, LSE) who will firstly deal with the generality of oyatoi gaikokujin – what manner of men were recruited, how they were recruited, the work they undertook in Japan, what happened to them after their contracts lapsed – before moving on to introduce the personal stories of four oyatoi-gaikokujin, including the engineer and photographer William K Burton, designer of Japan’s first skyscraper. This event will be chaired by Dr Akira Matsuda of the University of East Anglia.